Catrinas, one of the most popular figures of the Day of the Dead celebrations in Mexico. Mexico’s Day of the Dead isn’t really a funeral custom as such, but because it is a day when people remember the dead, it fits right in with this series. 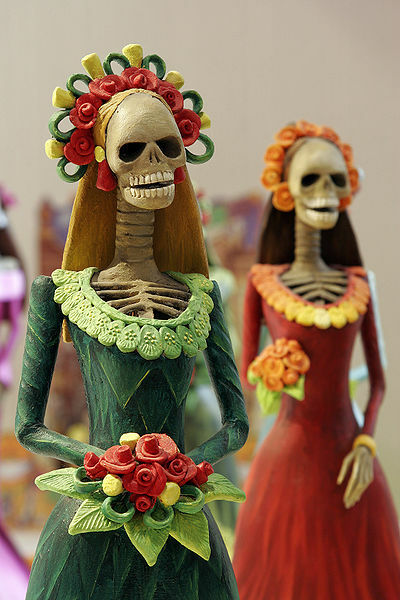 The Dia de los Muertos isn’t one day, but two. It’s related to All Saints Day and All Souls Day, which take place on November 1 and 2 respectively. Mexican civilizations have been observing celebrations of this type for up to 3,000 years. In the Aztec period, the festival that was the forerunner to the modern holiday ran for a whole month! To keep things simple, each day has its own function. In many parts of Mexico, children who have died are remembered on November 1, and that day is dubbed ‘Dia de los Inocentes (or Angelitos)’ – Day of the Innocents (or little angels). November 2 is for remembering adults who have died, and is called the Day of the Dead. Key parts of the ceremony include visiting cemeteries, cleaning and decorating graves (with marigolds and offerings). These offerings may include toys for children, food, bottles of tequila or mezcal and other trinkets or favourite items. People may also set up shrines or alters in their homes. This is also a public celebration, which takes place in schools as well, while persons may choose to show their respect by creating poems and songs. Skulls are key symbols of the holiday, to be seen both as masks and as candies. There are a number of local variations in the celebrations, which also take place in Mexican communities in the US and in other Latin American communities. Many other cultures also have similar celebrations, which only serve as concrete evidence that mourning and celebrating the lives of our loved ones is a universal impulse.